Water Fun All Day Long! Here at Emerald Shores Hotel, our pool deck is front and center to the amazing views of the Atlantic Ocean. 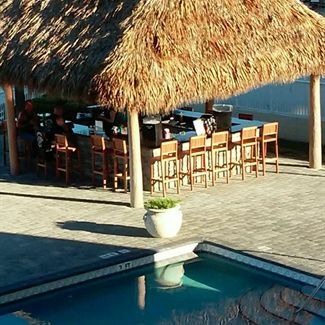 You'll find several lounge chairs, shady umbrella covered tables and nicely appointed bar stools along our BRAND NEW Tiki Bar! The splashes and memories can continue year round in our Heated pool and Spa Tub! Vacationing at Emerald Shores allows you to stay right on the beach and less than 3 minutes away from the Halifax River; what better place to enjoy water activities for all members of the family. One of the best things about Daytona Beach is the hard packed sand perfect for driving! Families love to spend the day at the beach with the convenience of having their personal vehicle near by. Some love to spend time driving up and down the beach while taking in the sights and sounds of the day. Kids getting a little restless? Daytona Lagoon's Water and Amusement Park is just minutes away! Lazy river, wade pool and long slides help ensure a great time! If you're looking for a little more excitement why not try para-sailing , Jet ski's or surf lessons! Also near by you will find Kayaking through Spruce Creek Preserve or head over to the Halifax River and enjoy the Dolphin & Manatee Paddle board Tours! There's so much more to Daytona Water Fun and our knowledgeable staff will be glad to answer any questions you may have.